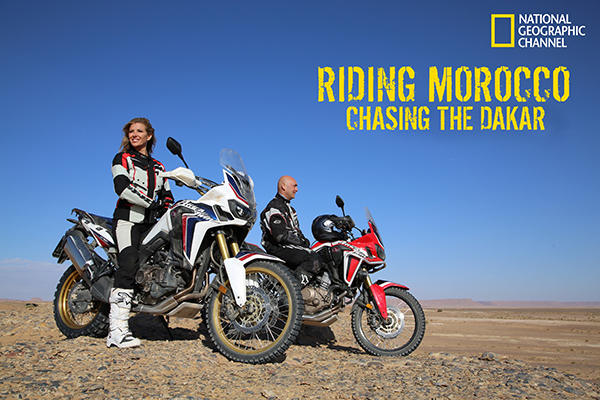 "Honda announced its provision of two CRF1000L Africa Twin adventure motorcycles and production support of the National Geographic Channel-produced "Riding Morocco: Chasing the Dakar" program. Australian fashion model Laura Csortan will be joined by veteran rally rider Christophe Barriere-Varju to traverse on CRF1000L Africa Twins a course in Morocco that was once part of the world's most grueling race, the Paris-Dakar Rally (now staged in South America as the Dakar Rally). On their extraordinary journey, they will experience breathtakingly beautiful valleys and expansive vistas, making new friends along the way. The duo will introduce to the viewer to the bike ride of a lifetime." "Christophe will share his vast knowledge and demonstrate serious manual-transmission off-road riding borne of his experience as a Paris-Dakar rider, while Laura will enjoy traversing an expansive continent on the DCT model, which does not require clutch operation. Honda's DCT-equipped motorcycles maintain the same direct feel as manual-transmission models, yet unburden the rider from clutch and gear-changing operations, providing a superior dimension of sports riding and convenience. Christophe's and Laura's Moroccan adventures, challenges and encounters will undoubtedly set the stage for a thoroughly entertaining program." "Christophe and Laura explore one of the most spectacular canyons in the world on two wheels."